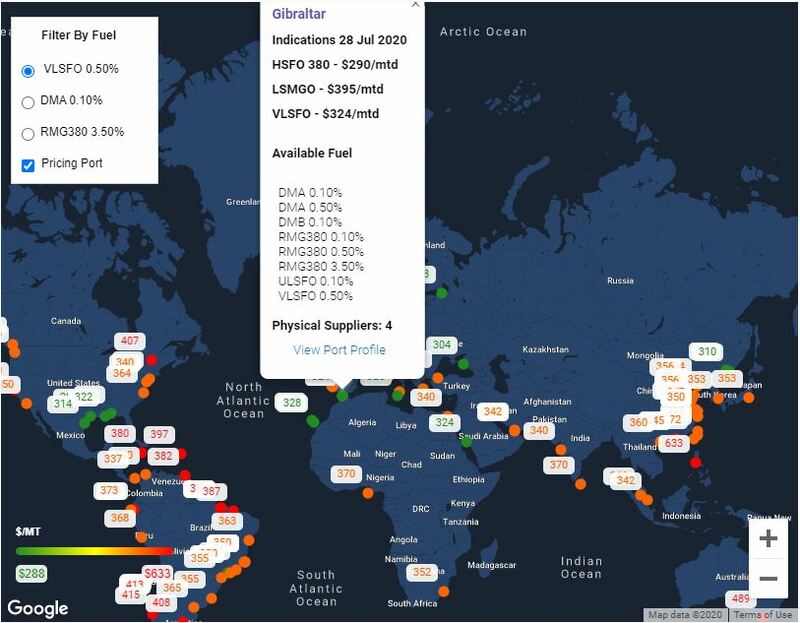 Real-time bunker fuel prices and availability of every grade of fuel oil at mutliple ports around the globe, plus long-term pricing trends for accurate, timely forecasting. Our exclusive volatility and Relative Strength Index (RSI) tools analyze current and historic price movements, allowing you to spot changes in strength, direction and duration. Port arbitrage capabilities enable you to quickly and easily compare bunker price and availability around the world, buying wisely and economically to get the most out of every fuel dollar. Your go-to site for future bunker price indications for key cargo indices and user custom measuring future impact on budget due to uncertainty. The world at your fingertips: what you need to know... when you want to know it. 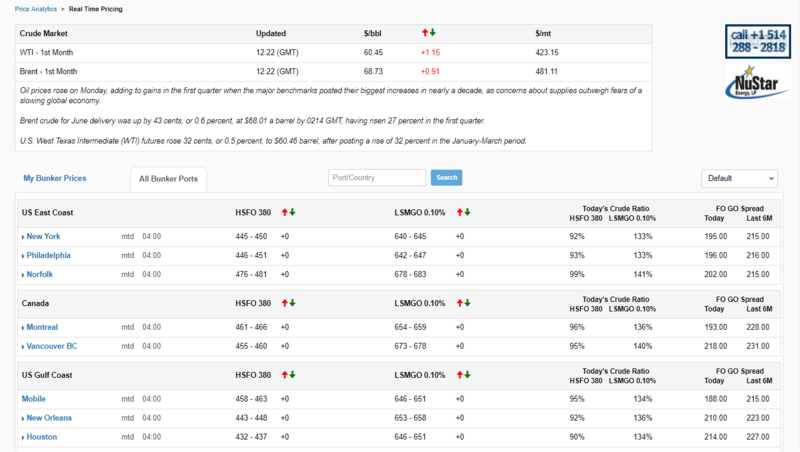 Real time bunker pricing in multiple ports of all grades of fuel and crude oils with up to date commentary on supply availability. ClearLynx Bunker Pricing & Analytics gives subscribers access to real–time pricing in 100+ ports around the world, representing more than 90% of bunker demand for all key grades, including WTI/Brent crude oils and low sulphur fuel oil. These reports offer buyers and sellers full bunker price transparency, while supporting their planning and purchase negotiations. The capture of real-time intraday volatility of $5-$15/mt combined with close of business price reports provides a valuable post–stem benchmarking tool for competitive market in key and secondary ports. Timely alerts focus on supply disruptions and other issues that may affect operations. Port arbitrage capabilities enable you to quickly and easily compare prices around the world, buying wisely and economically to get the most out of every fuel dollar. With ports having a spread of $5-$75/mt on any given day, buyers need to shop by comparing spot and forward prices, while sellers need to monitor spreads between their supply ports and competing ports for business. ClearLynx Pricing & Analytics reports current and historic pricing differentials at multiple ports, including spreads on Non-Platts reported ports. 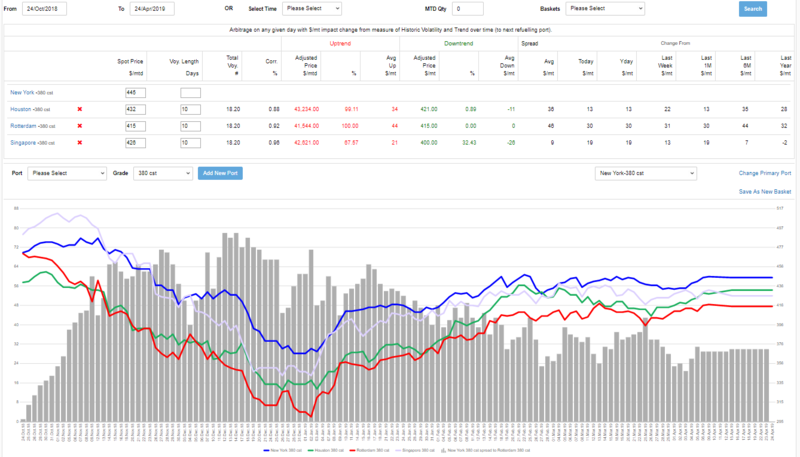 Users can select any set of ports to compare spot and historic price spreads with added analysis of the impact past volatility and price trends for various refueling time periods. Bunker prices can be highly volatile from port to port based on factors like local supply/demand, psychology of buyers and sellers in each port, external events as well as economic strength and weakness, political tensions crude prices and their inventory levels, and weather. 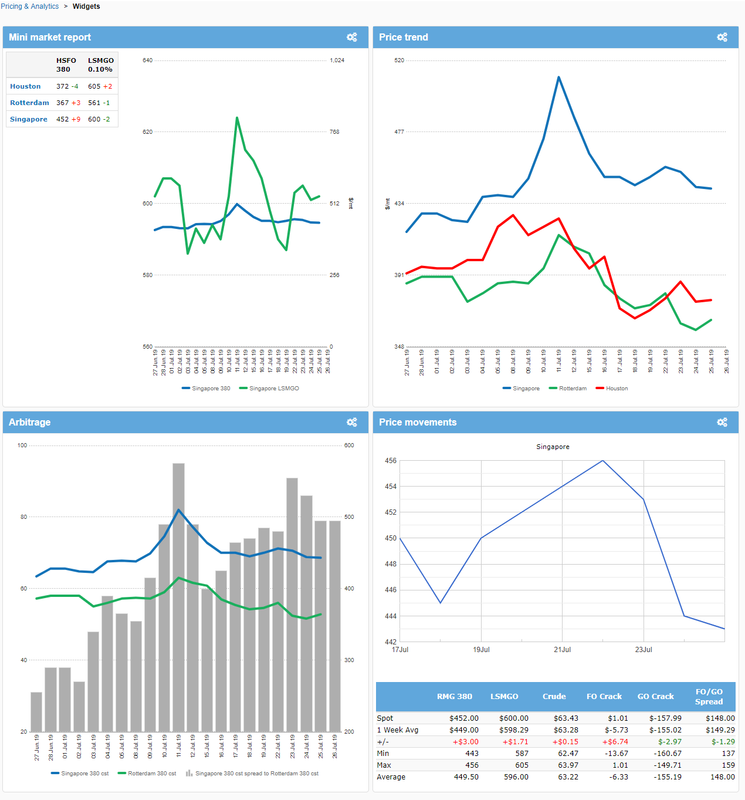 ClearLynx Pricing & Analytics assists with decisions like when and where to stem by providing daily values and giving the user 2-5+ day historic trend patterns by port to help them decide – "when to stem". ClearLynx Pricing & Analytics proprietary, exclusive Relative Strength Index(RSI) enables users to chart current and historical strength/weakness of prices recent and over historic trading periods. Our charts also incorporate Moving average convergence/divergence (MACD) to help users determine future price movements. 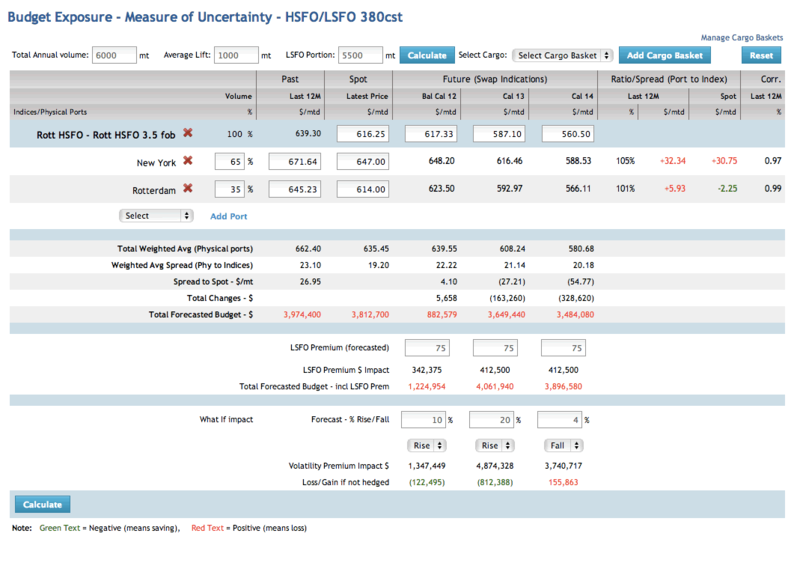 Your go-to site for future price indications for key cargo indices and user custom measuring future impact on budget due to uncertainty. Prices are influenced by many factors that have daily counteractive positive and negative impacts. ClearLynx Pricing & Analytics provides a blend of spot and hedging buying strategies- spot, contract, and Futures paper swaps. ClearLynx Pricing & Analytics subscribers can view the spreads of indices to spot over past time periods to the current day to measure changes in backwardation and contango of the forward swaps. 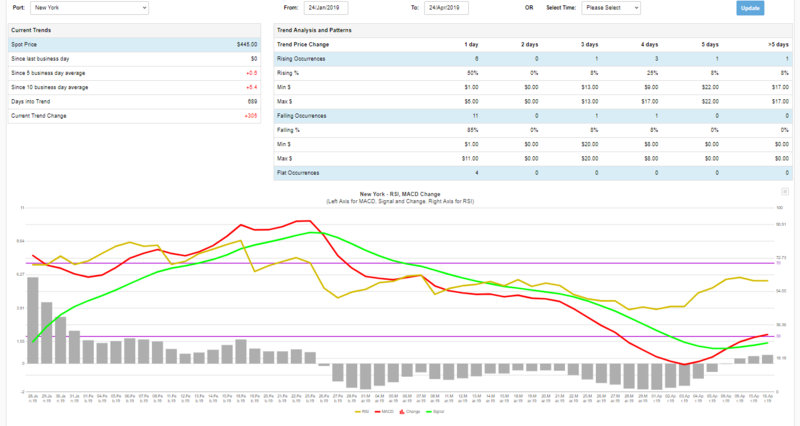 Due to market uncertainty impact on annual Budgets ClearLynx Pricing & Analytics has a monitor that can be customized by the user to view their budget exposure based on swaps and also 2020 NGO or LSFO and “what if" price change scenarios. Technical and financial benchmarking, port-to-port and supplier-to-supplier data for same and different grades based on current and historic samples from major testing companies. ClearLynx Pricing & Analytics provides financial and technical benchmarking, including energy, proprietary scoring methodology CVB (ClearLynx) and EFN (Viswa) of fuels and conversion calculators. We team with major laboratories that test in most key bunker ports to provide comprehensive data buyers rely on to achieve the best value for the price paid. Key capabilities include: Financial benchmarking for the “most oil for the price”. Technical benchmarking providing the relative weighted scoring of the key corrosive element levels that impact maintenance costs; and density variations (BDN to lab test reports for historic short/over delivery trends). Compare same port among competing suppliers; same port, two competing grades; and different ports, same or different grades. Quickly access the tools you will use on a frequent basis, all in one place. Nine fully functional calculators for "bunker only" deviation, BDR density variances, off spec blending to spec, conversions and more. ClearLynx Pricing & Analytics offers nine different calculators, including a fully functional deviation calculator for multiple "bunker only" options with built in distance tables, price feeds, port expenses and easy to use entry screens for all voyages routing combinations ,speeds, consumptions, daily hires and more. Our easy to use calculators are a handy assistant providing instant answers for many frequent tasks- blending, density, quantity and handling any non-conformance to specs that can be settled with a commercial credit on price or to invoice. 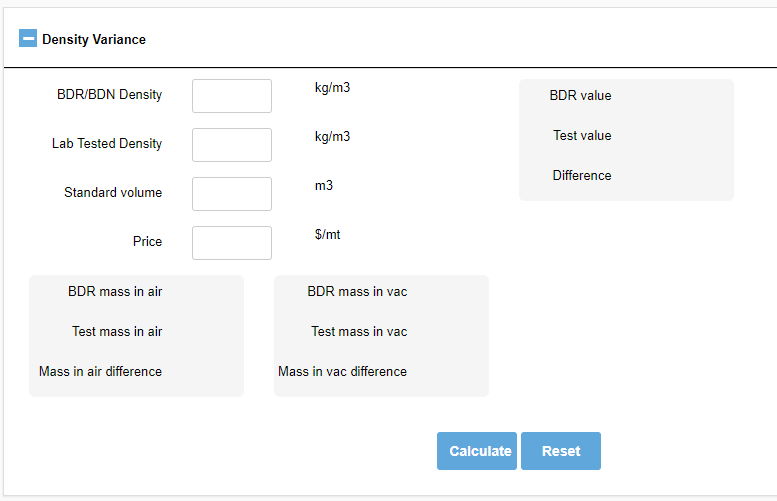 Use the BDN density calculator to compare reported density to the post–delivery vessel sample tested. Quick access to world and regional ports on Google maps overlaid with pricing for all grades available. ClearLynx Pricing & Analytics gives access to over 100+ ports on a world map with easy scroll focus to key areas offering ports in easy view relative to each other and with pop up tabs with spot prices on all grades available. There is also special highlighting of key "bunker only" ports to assist in planning. The geographic presentation complements the real time pricing report by putting into perspective the proximity and competitiveness of one port relative to another as users plan their refueling and suppliers see pricing of regional supply ports competing for a vessels fuel demand. ClearLynx Pricing & Analytics offers the spreads of Cargo (large bulk volumes) price indices to retail (smaller volumes) as they are key to influencing the structure of floating price term contracts and futures swap contracts as they are more actively traded and well correlated to most bunker ports. High volatility and the uncertainty of future supply in many key and secondary ports has created a demand for Term contracts to lock in physical supply and price into the future periods beyond the normal spot market. The five key world bunker and crude cargo indices due to their higher trading liquidity provide the basis for structure and securing long term Physical supply and Paper (futures) contracts for buyers and sellers buying and selling in 100 key ports. ClearLynx Pricing & Analytics using its extensive historic databases has created historic analysis to allow the measure of spreads and correlations between cargo and 100+ physical ports over time so users can measure and evaluate for new contracts or measure performance of existing contracts coming up for renewal. To deviate and stop to refuel in the many "Bunker only" physical supply locations in key strategic locations has become very popular and we offer a quick calculator to assist users in measuring relative competitive value. ClearLynx Pricing & Analytics has identified all the key and popular Bunker Only ports to assist buyers when considering them as competitive refueling stops enroute on their various cargo routes. 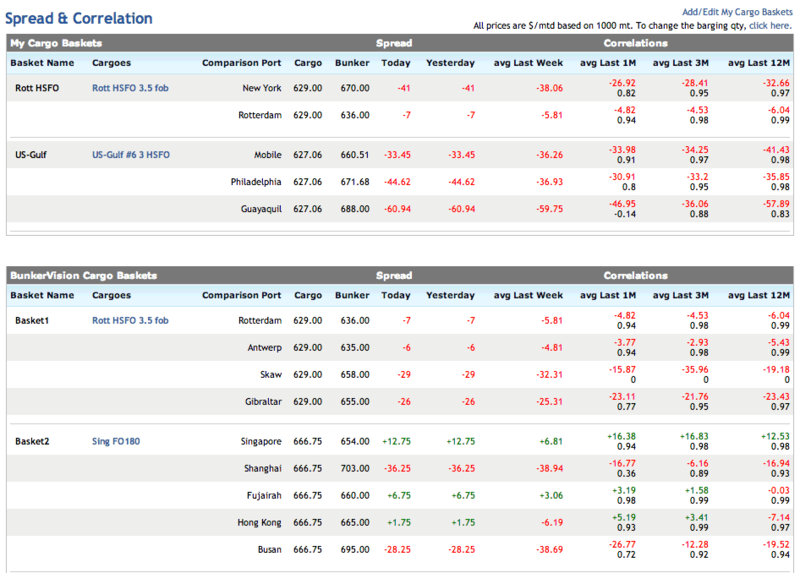 ClearLynx Pricing & Analytics has developed a calculator with built in distance tables, real time price feeds and easy to read format to allow easy entry of all needed data to make an accurate net price “apples to apples“ evaluation of these ports relative to the normal cargo load and discharge ports. The user can build custom formats for their most popular “Bunker Only” ports for specific vessel sizes with different freight hire value, consumption and port calling expenses. ClearLynx Pricing & Analytics provides efficiency as it allows many of its key trading data screens to be customized and or interactive on demand to a buyers and sellers need for specific calculations. ClearLynx Pricing & Analytics provides an added efficiency utility by allowing users to customize and set up their preferences for specific port pairs or baskets for arbitrage monitoring, Quality benchmarking for key ports and grades and Real Time port pricing for buyers most called ports and suppliers specific supply ports and competing ports. The IQ report is a "market close" report that gets emailed directly to you at the end of every business day. Many buyers use this report for post-stem competitive benchmarking. Timely alerts and commentary focus on supply disruptions and other issues that may affect operations. Discover ClearLynx Pricing & Analytics.